Kristin is one of my oldest and dearest friends. We’ve known each other since childhood, so there are only about, I don’t know, a million memories between us. And although we live in different cities and don’t get to see one another often enough, we always pick up right where we left off. It’s rare to have friends for decades. I know how lucky I am. Happy Birthday bonded bud. 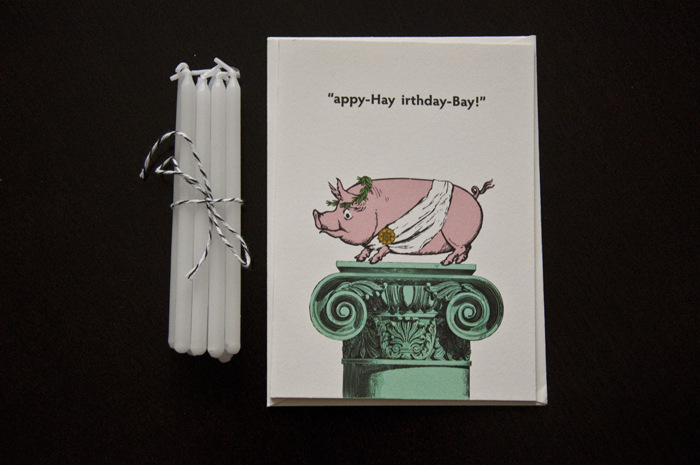 Remember when pig latin was all the rage? And we’d spend hours by the pool pig-coding our crushes names in conversation (as if the over 65 crowd were in constant contact with said crushes). Ah, to be young again. But instead, you’re another year wiser, another year closer to accomplishing all those goals and realizing your dreams. Let’s go with that. I hope you have the most wonderful birthday (holiday weekend birthdays do have their perks). And I hope this year brings lots of goodness personally and professionally–I have a feeling it will. I wish I was there to help celebrate, but you can always count on me to eat cake in your honor. Love you lots bonded bud. P.S. I know we’ve stopped counting birthdays, but how about a shout out to 25 years of friendship–we should totally take a cruise or something, wink.